Coombs Inn and Suites – The finest Apalachicola Hotel, the most romantic luxurious Inn, in Florida. Welcome to Coombs Inn & Suites, ranked “One of the 30 Outstanding Small Inns in the United States”, by Travel and Leisure Magazine. 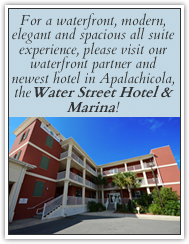 A luxury boutique Inn nestled in the heart of the quaint fishing village of Apalachicola. The Coombs Inn & Suites is a luxurious Inn consisting of three elegant Historic Victorian Mansions located on the unspoiled Gulf Coast known as, “Florida’s Forgotten Coast.” For 20 years our visitors have returned to our relaxing, romantic accommodations for a quiet alternative to typical Florida hotels. Less than 2 hours from Panama City Beach and Tallahassee, the historic, picturesque village of Apalachicola is located just minutes to the pristine white beaches of St. George Island , and near Cape San Blas, Mexico Beach and WindMark Beach in Port St. Joe. Walk or use one of the our complimentary bikes to explore nearby boutique shops, museums, art galleries, and waterfront cafe’s serving fresh local seafood and world famous Apalachicola oysters. Stay in one of our luxurious guest suites furnished with European antiques, original oil paintings and oriental carpets on gleaming hardwood floors. All 23 rooms have private baths (7 with romantic whirlpool massage spas), complimentary hi-speed Internet, in-room coffee and flat screen cable TVs. Several 2 to 3 room suites are available, some with kitchenettes and private verandas, perfect for family vacations, bridal wedding parties, girl’s getaways and Corporate retreats. From complimentary breakfasts, to tea and cookies in the afternoon view our complete list of amenities and learn more about our unique area.